(Cleveland, OH) – The unlikely heroics of Brendan Haywood helped the Cleveland Cavaliers close out the regular season with an exciting 113-108 overtime victory versus the Washington Wizards in Wednesday night action at Quicken Loans Arena. Haywood split a pair of free throws with 34.2 seconds left in the extra session to make it 107-106 in favor of the Cavaliers, but the Wizards connected on a basket five seconds later to take the lead back. Then, with 10 seconds left, Haywood hit a short jumper to give them the lead for good. After the Cleveland defense forced a five-second call on Washington, Matthew Dellavedova connected on a pair of free throws to increase the lead to three at 111-108 with 9.1 seconds left. Shawn Marion then capped the victory with a dunk in the closing seconds. Trailing 79-74 after three quarters, the Cavs roared to life by taking a nine-point lead in just over three minutes of action, with a 15-1 run for an 89-80 lead. The combination of Iman Shumpert and Dellavedova did all the work, with each hitting a pair of three-pointers during the push. With 6:36 left, the Cavaliers held a 93-83 advantage, but the Wizards kept whittling down the lead until tying the game with 1:35 left. After Kendrick Perkins connected on a jumper with 50.5 seconds to go to make it 101-99, Washington sent it into overtime on a jumper with just 7.2 seconds remaining in the ball game. The victory was accomplished without the presence of LeBron James, who was held out for additional rest before the start of the postseason. At the start, the Wizards threatened to turn the game into a rout in the first quarter, jumping out to a 23-8 advantage with 4:33 left. During that stretch, center Timofey Mozgov served as the bulk of the Cleveland offense by notching six of the eight points. Kevin Love then helped chip away at that deficit by hitting for eight points to spark a 10-2 run, including a pair of threes that were sandwiched around a Kyrie Irving jumper. By the end of the quarter, Washington led 28-18. Within the first few minutes of quarter number two, the Cavaliers had gotten the margin down to seven at 34-27, but the Wizards quickly ran off six straight points to boost the lead back up to 13. That margin would stay in double digits, reaching a high of 15 at 52-37 with 4:41 left before halftime. At that point, the Cavs surged back as Love sandwiched another pair of threes, this time around a Mozgov basket. Before sitting out the rest of the game, Love led all scorers at the half with 19 points. He hit on six of 12 from the field, but five of six from beyond the three-point arc. When the second half began, Cleveland finally took its first lead of the game on a Shumpert three with 8:53 left in the third that made it 61-60. 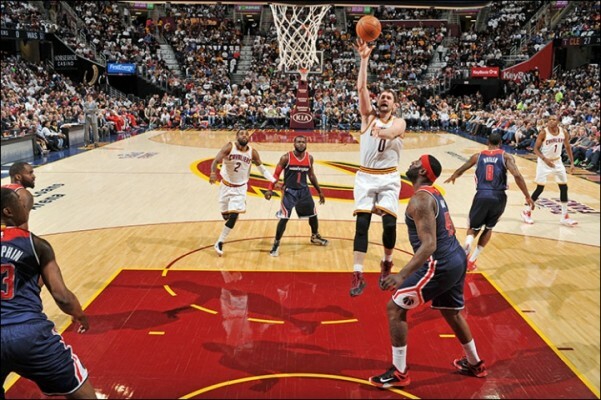 The Wizards tallied five unanswered points and never let the Cavaliers get closer than two points. By the end of the quarter, Washington maintained a five-point lead at 79-74, and set the stage for the comeback that led into overtime. Making his first trip to the postseason has Irving excited, as he noted in postgame comments. “Now we can stop talking about the regular season and get ready for the playoffs,” said Irving. 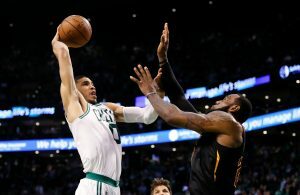 The Cavaliers’ first playoff game will be on Sunday at home against the Boston Celtics, though the time has yet to be determined. “All the things we’ve been through have made us stronger, and while it doesn’t guarantee us anything, it’s a good thing,” said Blatt.